Starting at 8:30 am, I touched down at Markers No 6 through 23 on Tuesday, all in the state of New York. At 5:15 pm, I crashed at the Colonial Inn on Route 20 between Markers 23 and 24. Hungry for vegetables, I happily followed the inn proprietor’s suggestion to eat at the sushi place across the street. 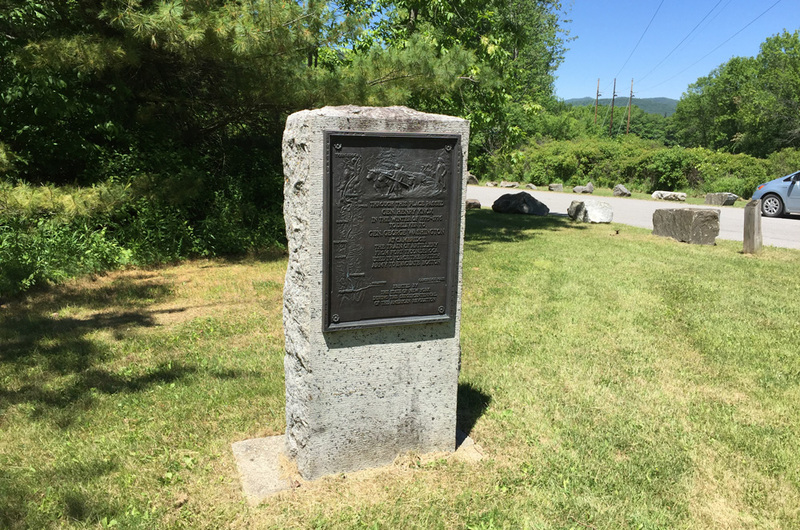 Marker 7 of the Henry Knox Trail in Roger’s Memorial Park, Bolton Landing, New York. All the markers in New York look like this but aren’t as well maintained. 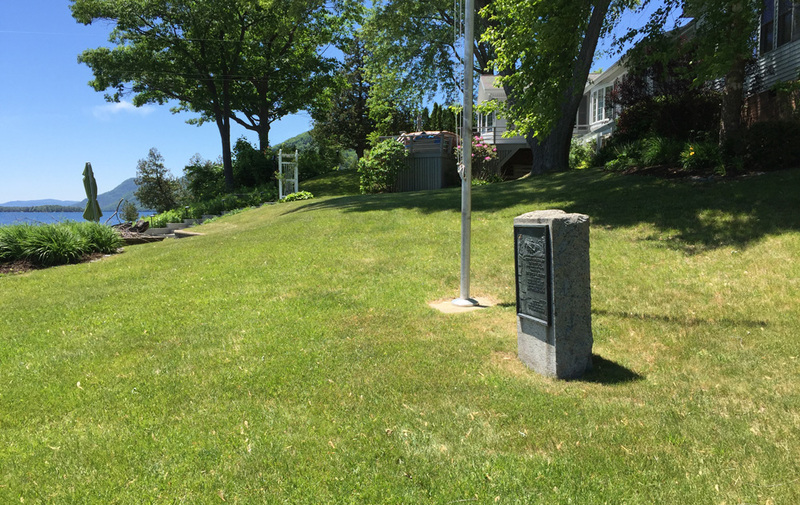 and Fort Edward (Marker No. 11). 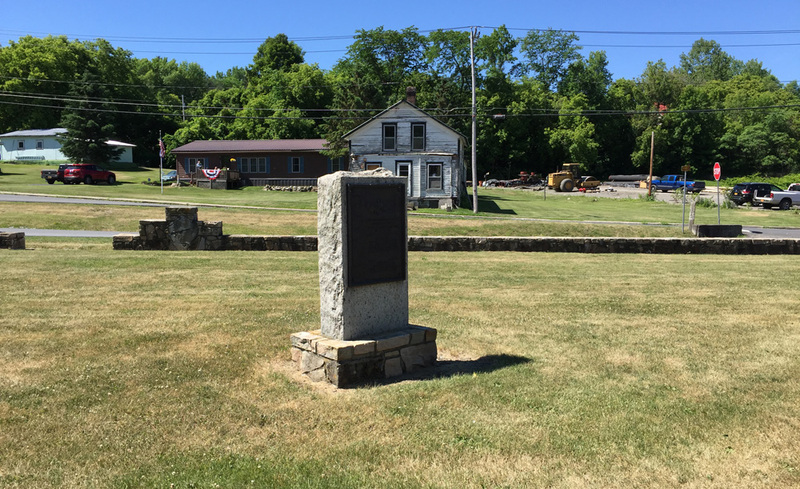 Place where General John Stark of New Hampshire held the British. A small park was created in 2000 where Monument No. 12 now stands, hidden in the brush. 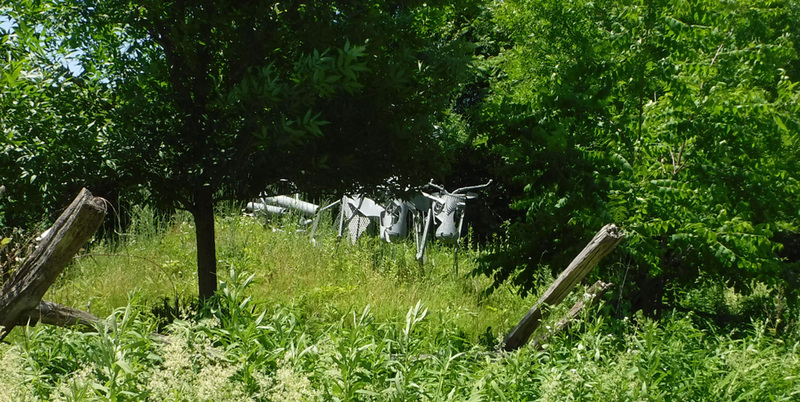 A modern statue of one of Henry’s ox carts keeps it company. Marker No. 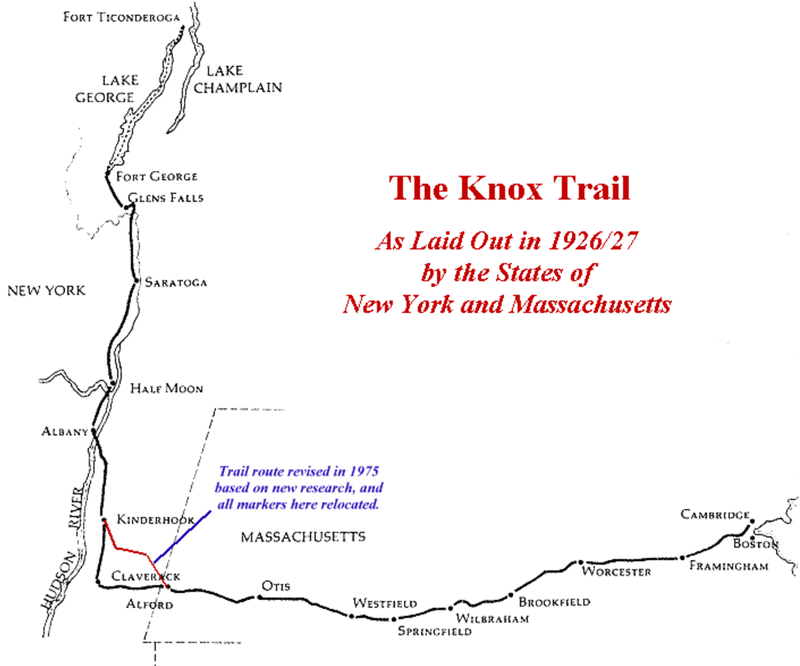 12 of the Henry Knox Trail at Stark’s Knob, named after the hill Stark defended during the Revolutionary War. 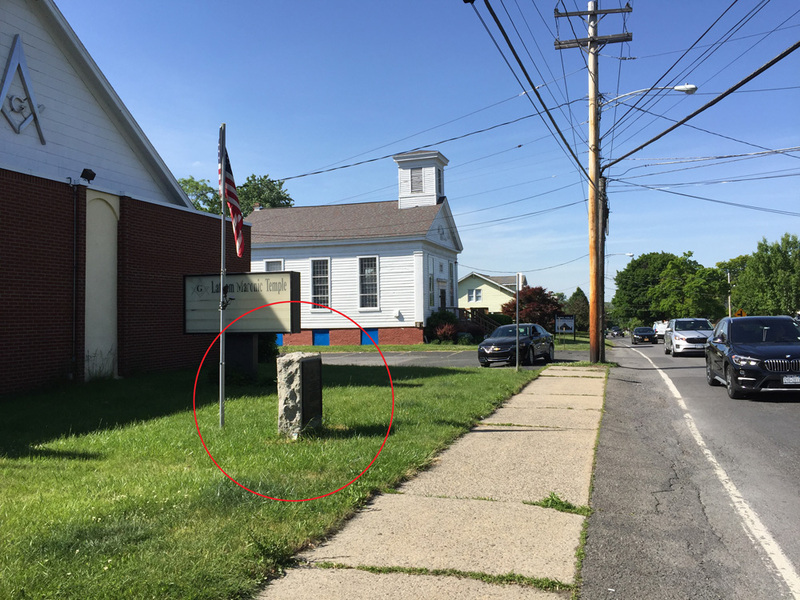 Position where Marker No. 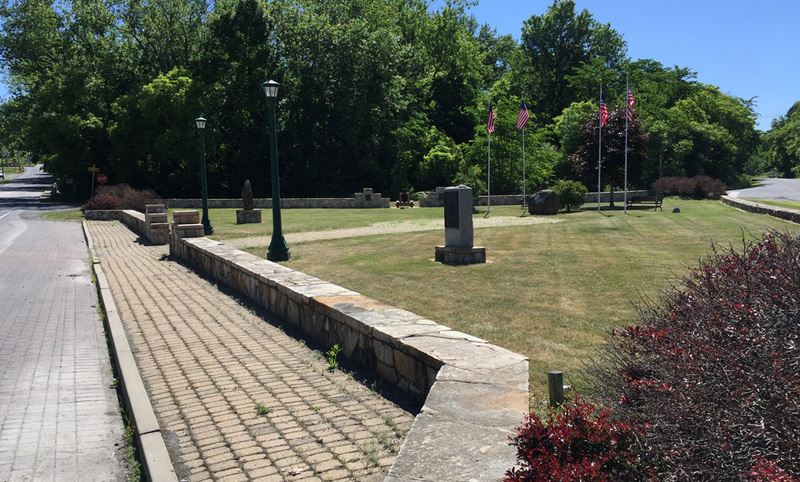 14 of the Henry Knox Trail once stood marking the location of Ensign’s Tavern where Knox stopped and dined. It is just north of Saratoga Historic Park. The marker is missing. Marker No. 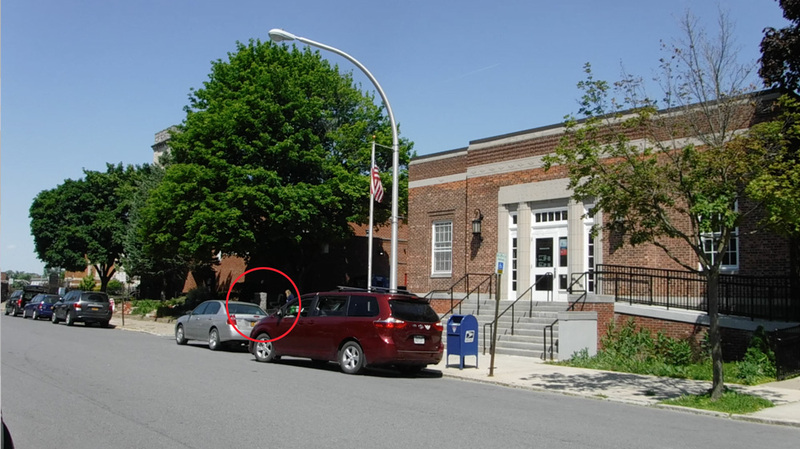 15 in Bemis Heights shows the location of the house where Knox stayed on Christmas Eve. Marker No. 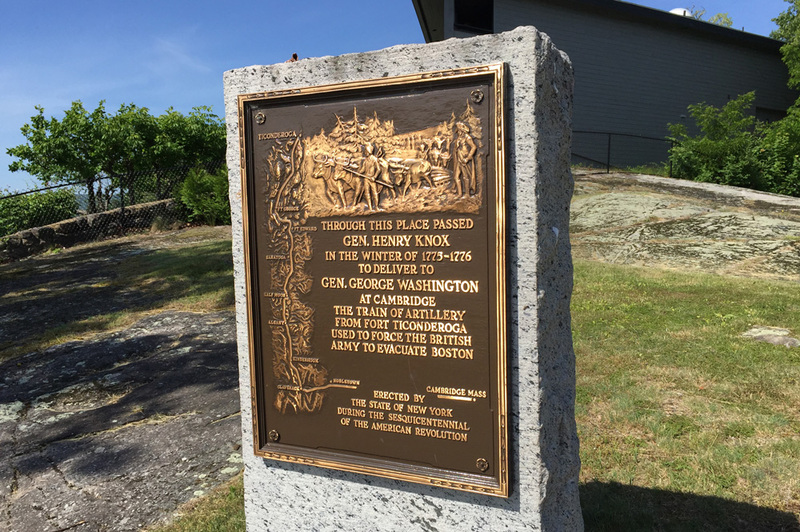 15 of the Henry Knox Trail near Bemis Heights, New York. Marker No. 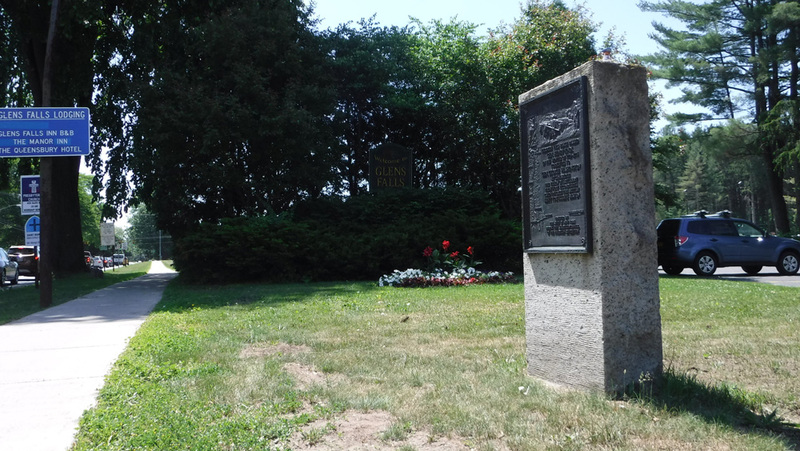 16 of the Henry Knox Trail in front of the Public Library in Stillwater, New York. Note the Hudson River behind the library. 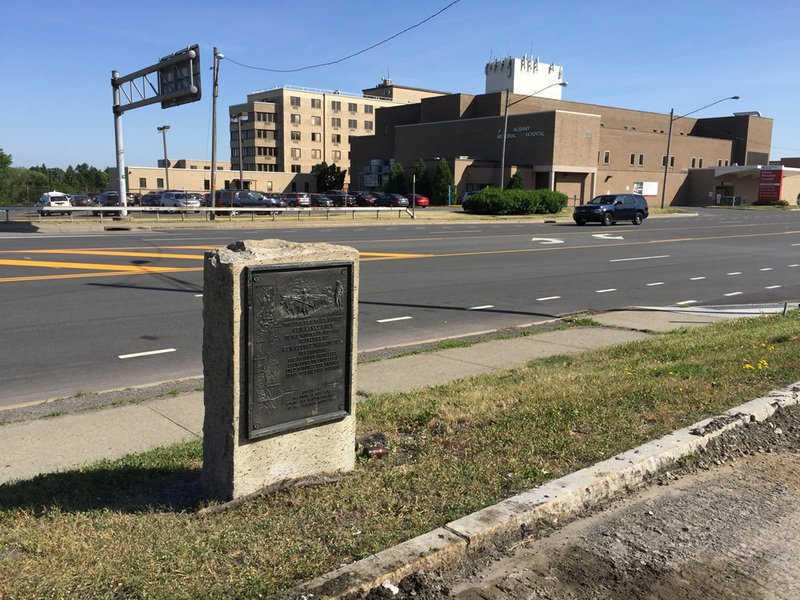 where he obtained another sleigh that would take him to Albany. 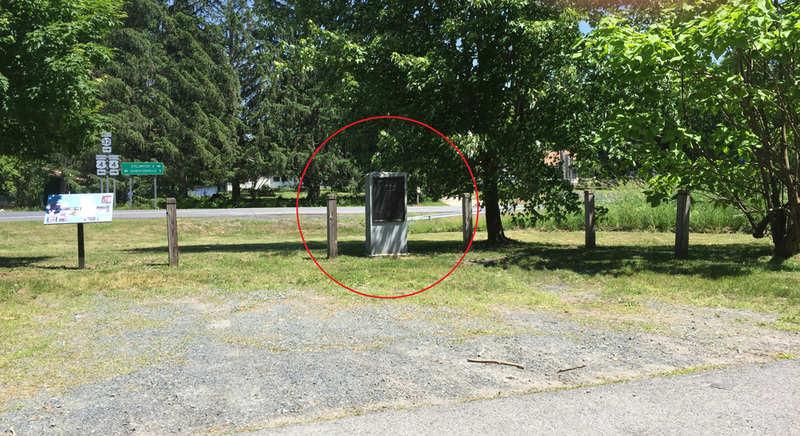 He passed through today’s Mechanicsville (Marker No. 17). 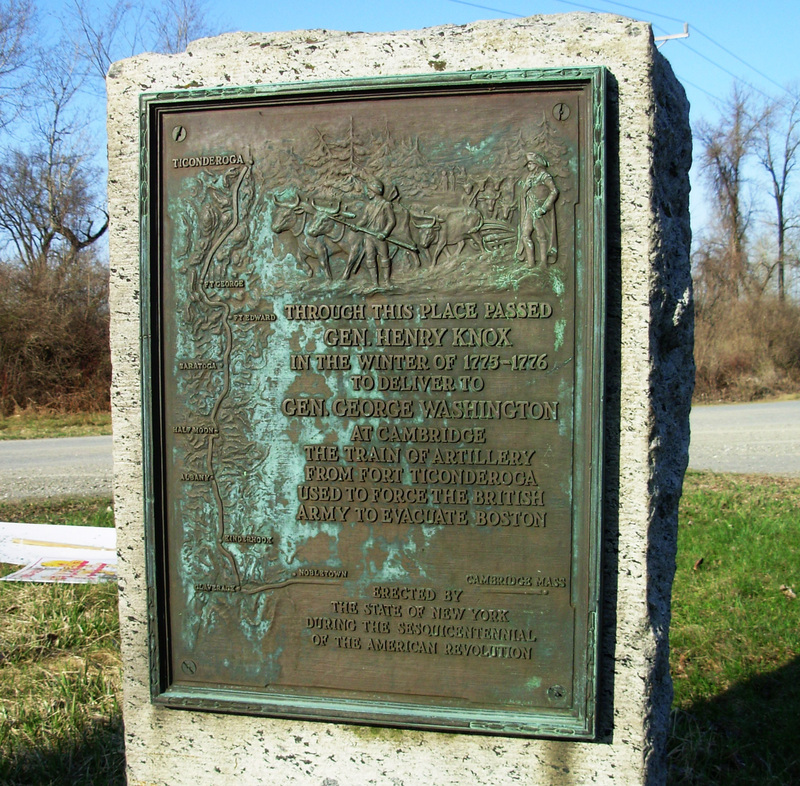 At Waterford (Marker No. 18) he forded took a ferry across the Hudson to the east side. 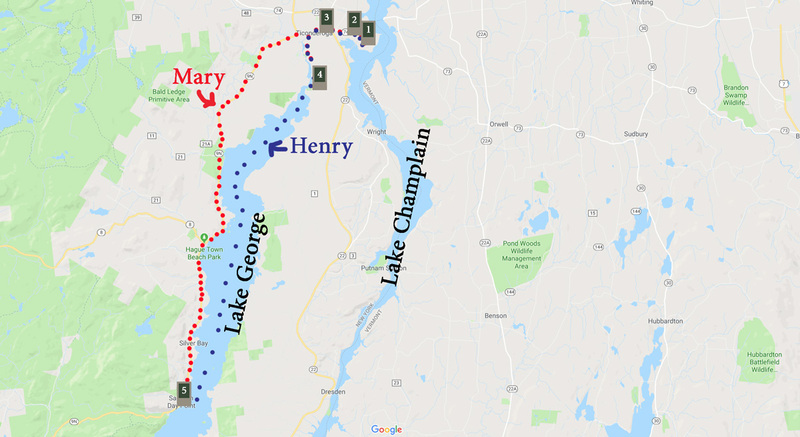 He wrote, “…the roads not being broken prevented our getting farther than New City [today’s Lansingburg], about 9 miles above Albany — where we lodg’d.” Henry may have crossed the Hudson via the Lansing’s ferry. Albany is on the west side of the river. 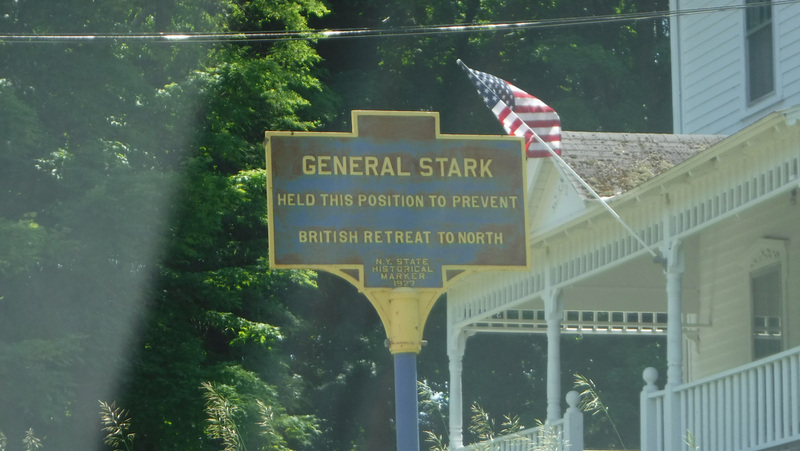 But the Train of Artillery had to deal with the confluence of the mighty Mohawk River and the Hudson River, a complicated and busy geographic roadblock. Knox first tried the “usual crossing” at Half Moon near Cohoes. The ice was too thin and he lost a sled and cannon. 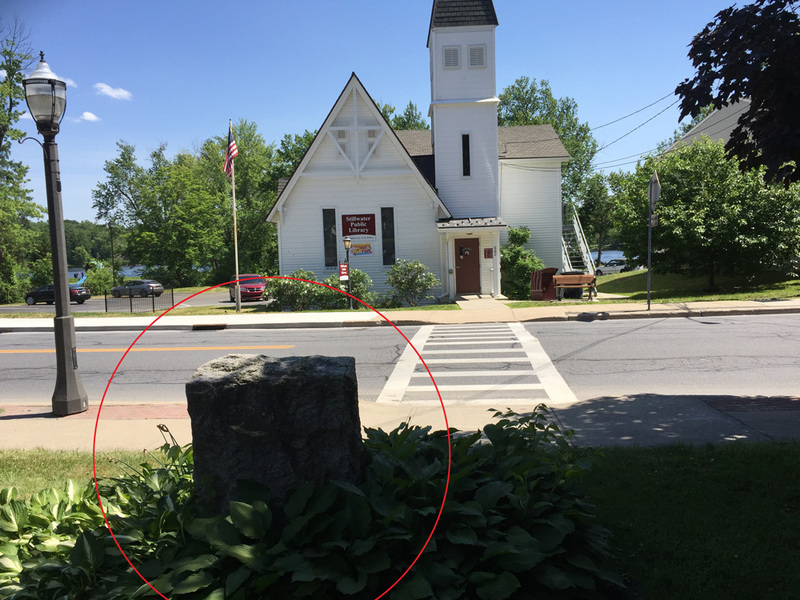 So he ordered the rest to cross “At Sloss’s [Claus’s/Klaus’s Ferry] as the ice was so much stronger …” Marker No. 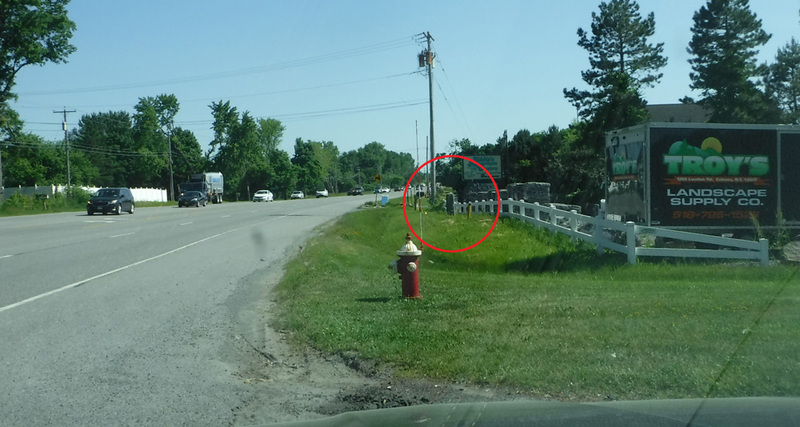 19 in Crescent stands by Route 9 south of the Mohawk River. 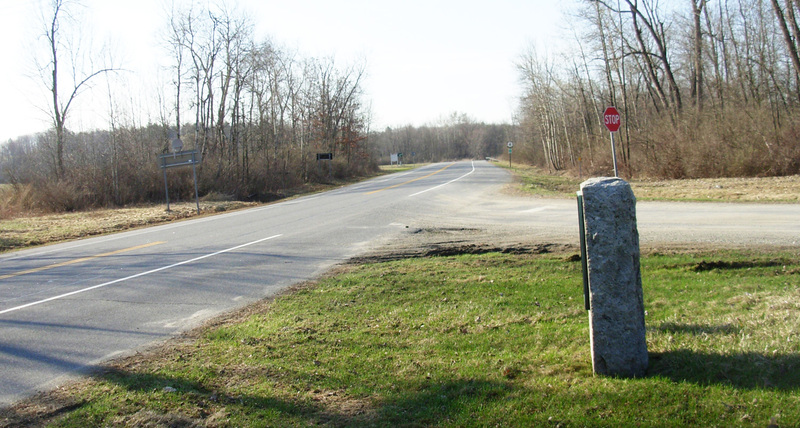 On January 5, after crossing the Mohawk at Claus’s Ferry, the Train of Artillery headed south along today’s Loudon Road (Route 9) toward Albany (Marker No. 20 in Latham). Marker No. 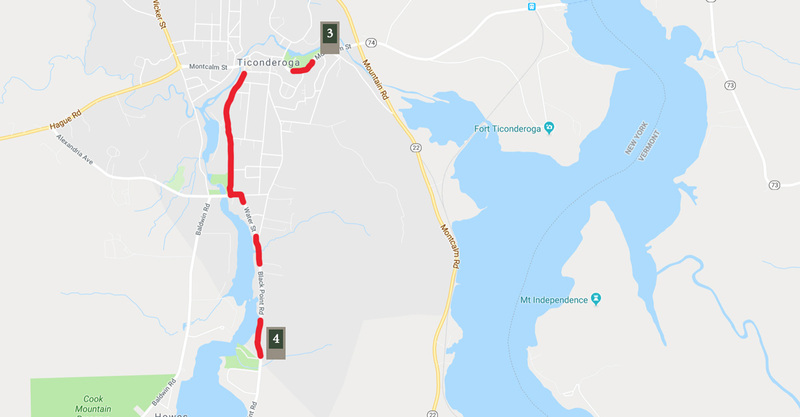 21 locates where the road turned into Albany. Today that “turn” is a major freeway intersection. Marker No. 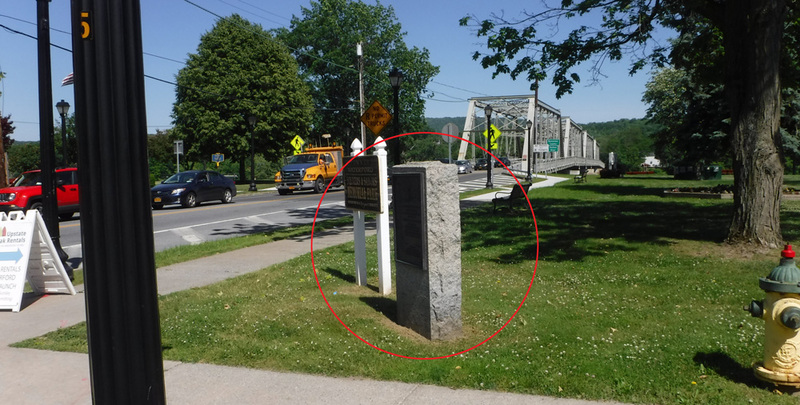 22 is now missing, It used to mark the place where the train forded the Hudson at Albany, placing the group on the west side on their way to Massachusetts. 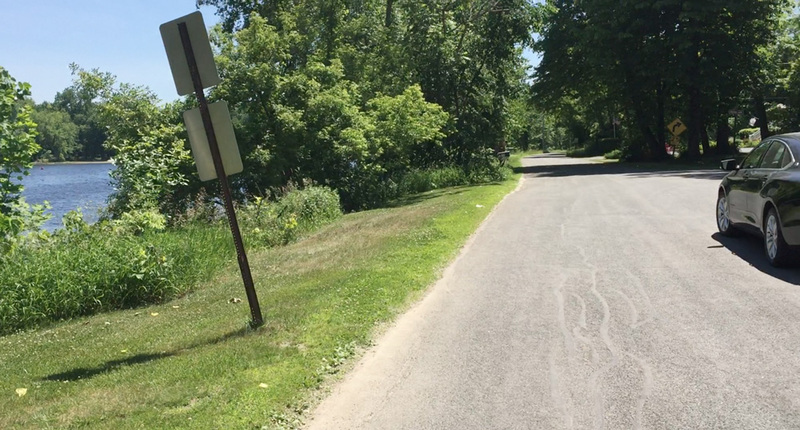 From the exit off the bridge in Rensselaer, the trail follows today’s Route 20, where I passed by Marker No. 23. It is surrounded by weeds. I bet few people who pass it know why it stands there. From here I travel southwestward toward Boston. 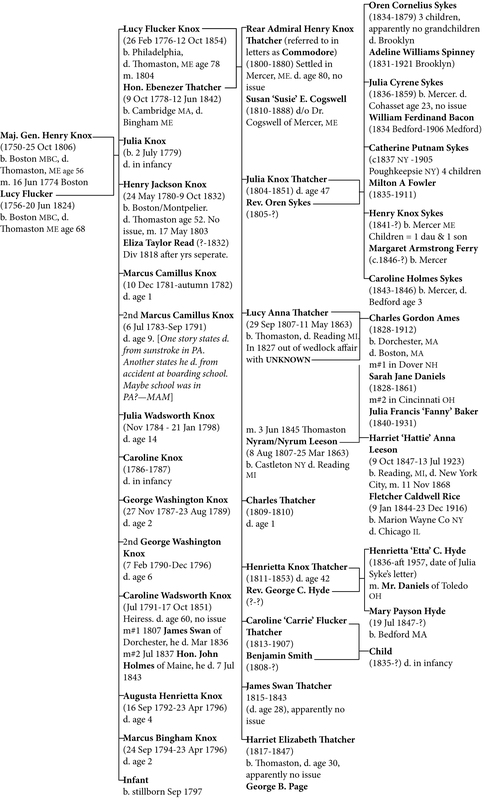 Searching for the markers for the Henry Knox Trail reminds me of geocaching. Marker No. 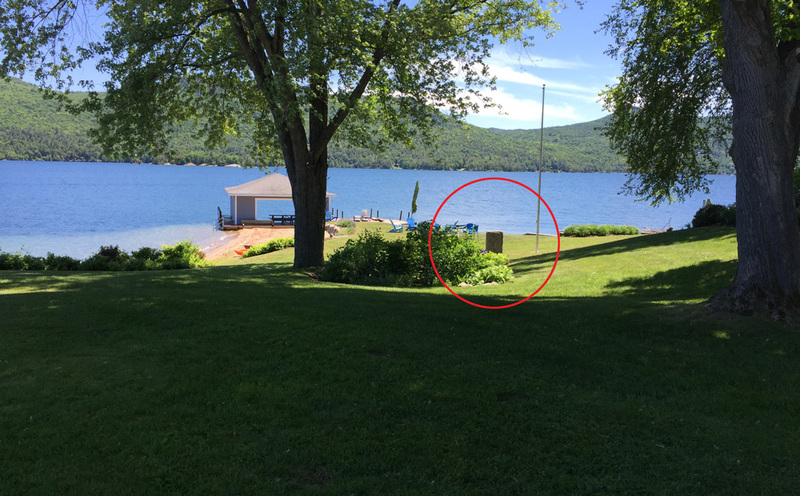 5 was especially difficult to find because it is on private property in the backyard of someone’s home overlooking Lake George. We had to trespass to reach it. 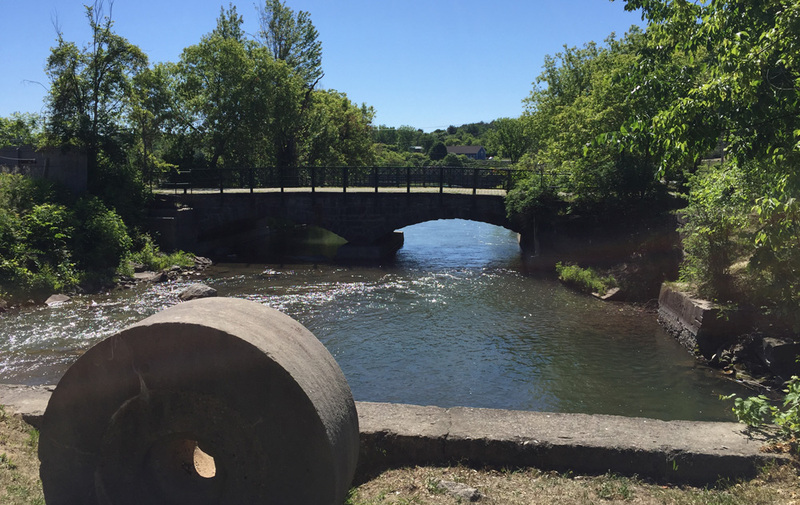 The boats were sailed or rowed around the peninsula of Ticonderoga into LaChute, a creek that tumbles over several waterfalls from Lake George to Lake Champlain. At the bridge, the artillery was transferred from water to land carriage. 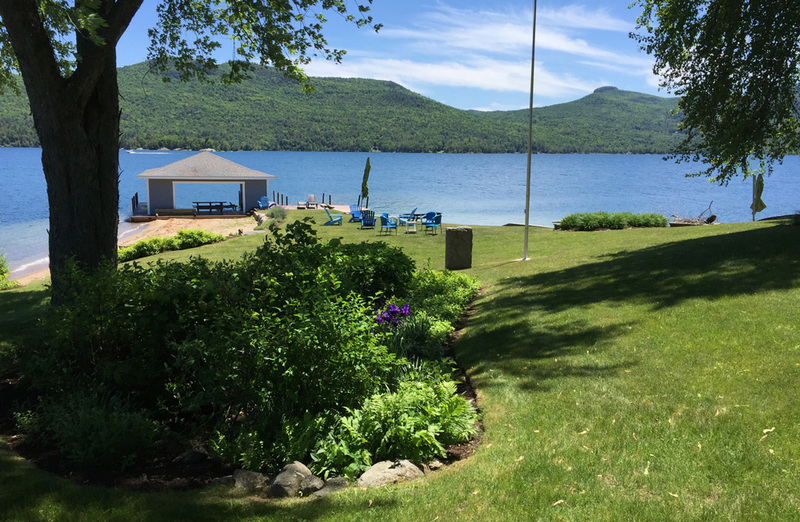 Loaded carts were pulled by ox and horses over the Portage Road – which still exists by that name – to Lake George. At today’s Mossy Point Boat Launch (Marker No. 4), the guns were transferred to a flotilla of boats to sail down Lake George. the heaviest pieces were placed on a “scow.” Henry also had a “pirogue” and a “batteau” at his disposal. He wrote, “Employ’d in loading the Scow, Pettyaugre and a Battoe. At 3 O’Clock in the afternoon set sail to go down the lake in the Pettyaugre, the Scow coming after us ran aground, we being about a mile ahead with a fair wind to go down but unfair to help the Scow. The wind dying away, we with the utmost difficulty reach’d Sabbath Day Point about 9 O’Clock in the evening – went ashore & warm’d ourselves by an exceeding good fire in an hut made by some civil indians, who were with their Ladies abed – they gave us some Vension, roasted after their manner, which was very relishing.” (Marker No. 5). 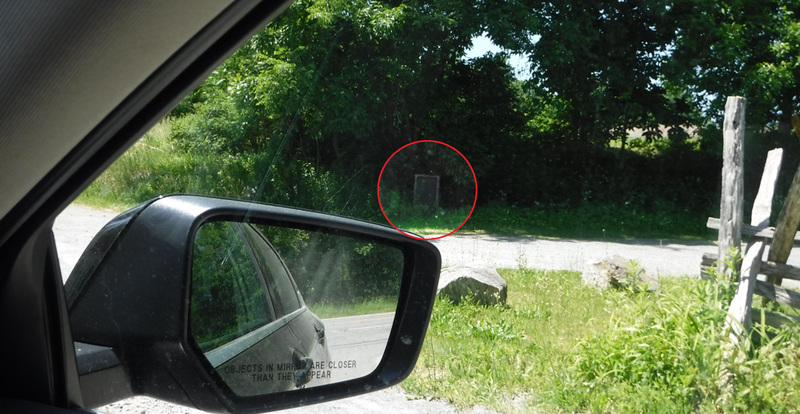 Heading from the fort toward the town of Ticonderoga, just after crossing Route 22, I found Marker No. 3 on the left (south) side of the street amongst a triangle of monuments. This is looking at the triangle from the other direction. Then I enjoyed walking around town. 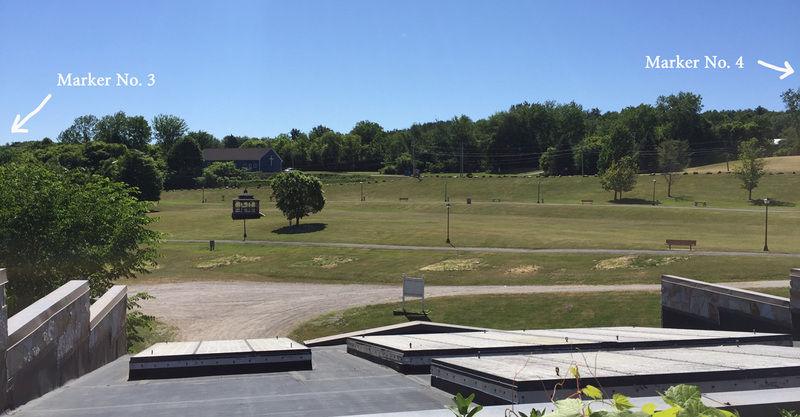 In this photo, LaChute is to the right and the Portage Road to the left. 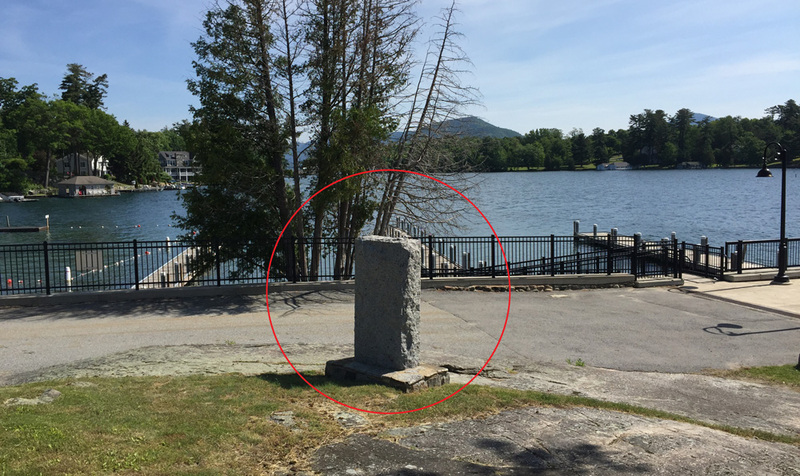 I’m facing the direction Henry would have traveled to get to Lake George. 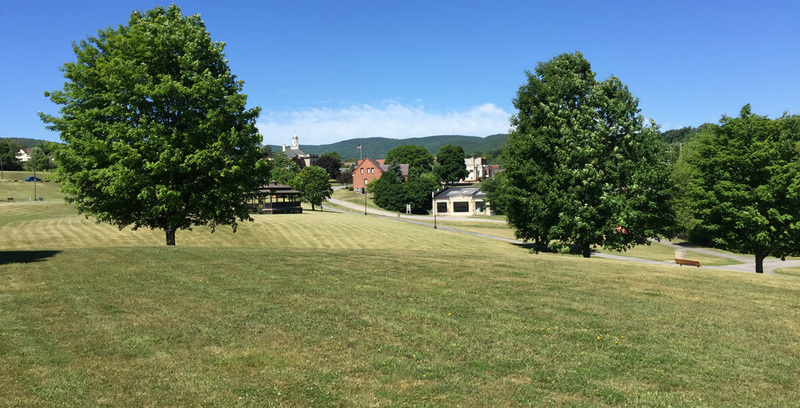 This photo was taken facing the hill, Knox traveled from Marker 3 toward Marker 4. Marker No. 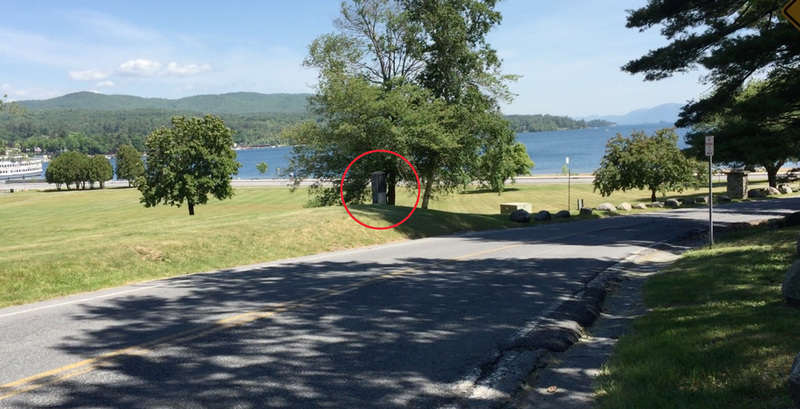 4 is at the Mossy Point boat ramp at the north end of Lake George. 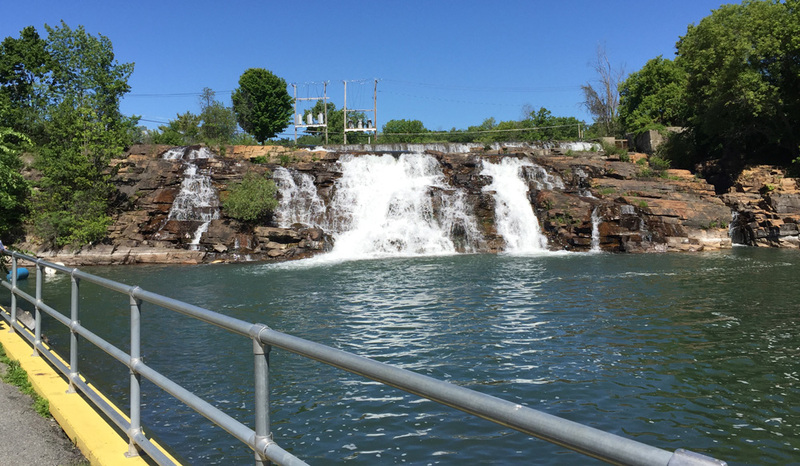 This is the last waterfall along LaChute before the waters flow into Lake Champlain. To get to Marker No. 4, we (Charlie, Paula and I) drove through town and south to Black Point Road. 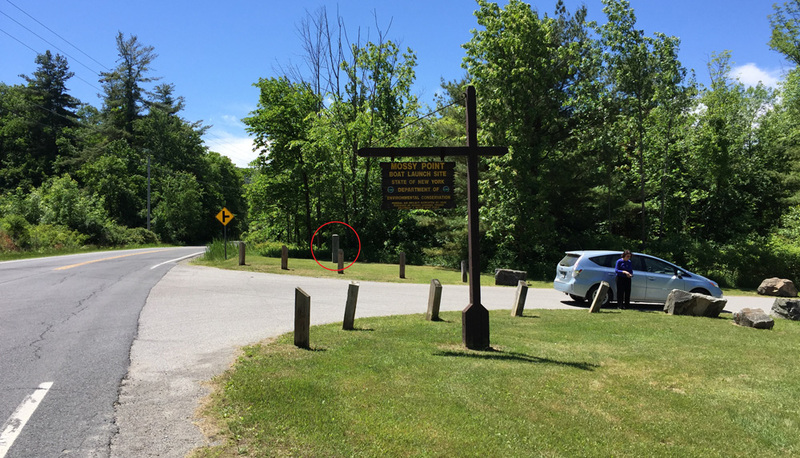 The marker is at the entrance to Mossy Point Landing. The markers in New York look exactly alike. They don’t have anything on them identifying what number they are. 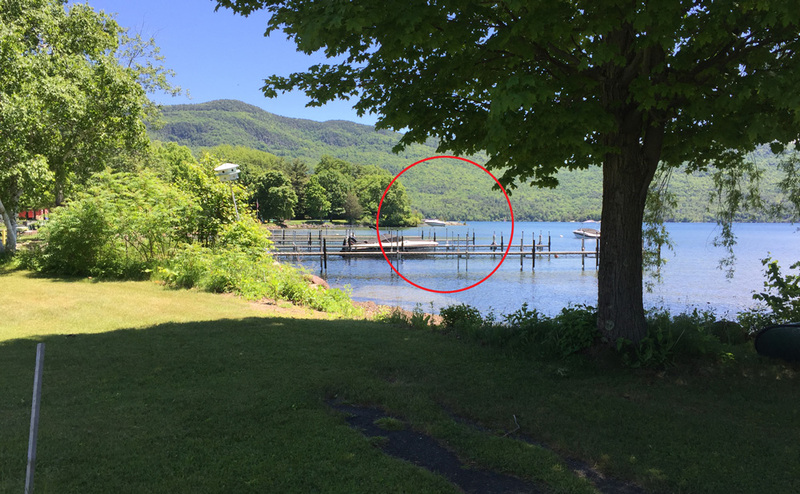 This is where the guns were loaded onto sleds on Lake George. From here we had to retrace our steps to Highway 9, then follow it south along the west side of Lake George to Sabbath Day Point. This map is the result of a lot of walking around Sabbath Day Village and asking people where the marker was. Not a soul had heard of it, not even a woman who had been spending summers in the village her whole life. An elderly resident figured out it had to be at the end of the point which was the back lawn of the residents who lived there. He pointed to this point. So we mustered the courage to trespass and found it. 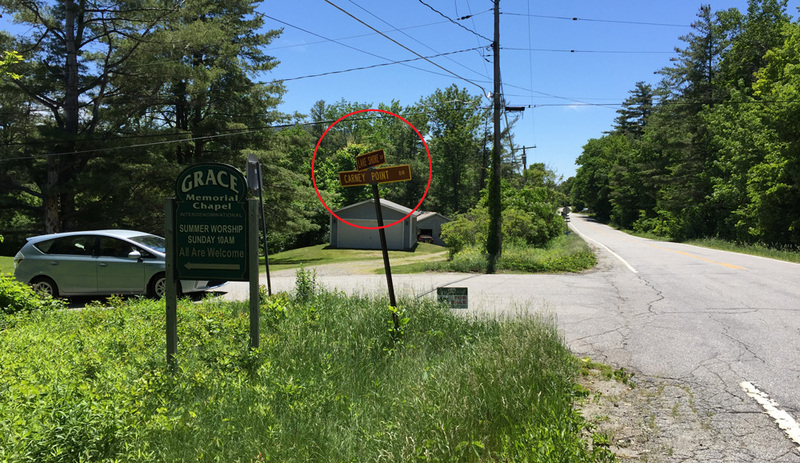 On the way out, I took this photo of the street signs for others to follow to reach Sabbath Day Point Village. 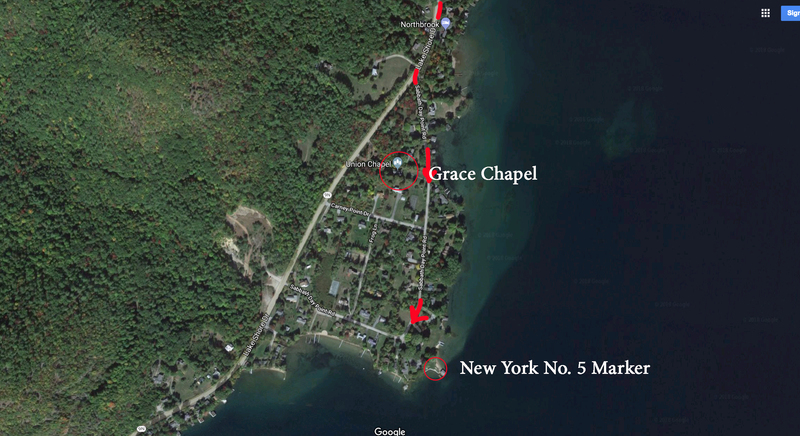 One of the residents recommended we take a look at the historic Grace Chapel. So we backtracked. 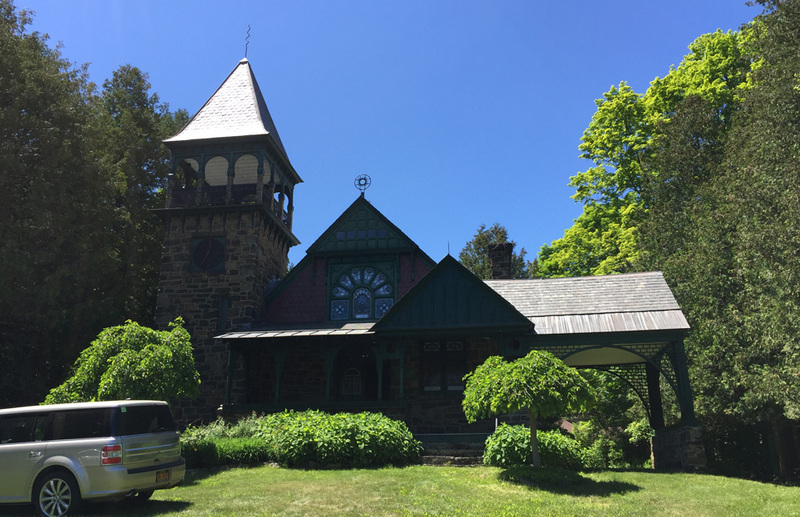 It was built in 1889.